The CEL team uses a holistic approach that integrates evidence and research with knowledge management and strategic communications for development to broaden and deepen the influence, utility, and impact of USAID work. The Bureau for Economic Growth, Education and Environment (E3) Communications, Evidence and Learning (CEL) project is a field support mechanism available to provide technical assistance to USAID field missions and Washington operating units. Funding for CEL derives from the Land and Urban Office and the Office of Local Sustainability, complemented by the following E3 Bureau offices: Gender Equality and Women’s Empowerment, Global Climate Change and Planning Learning and Coordination. The project is structured to guide program design and implementation, inform policy discussions and improve decision making to maximize the effectiveness of resources in the areas of: 1) land tenure, property rights and resource governance, 2) urban development, urban-based programming and sustainable urbanization, and 3) locally-led sustainable development. 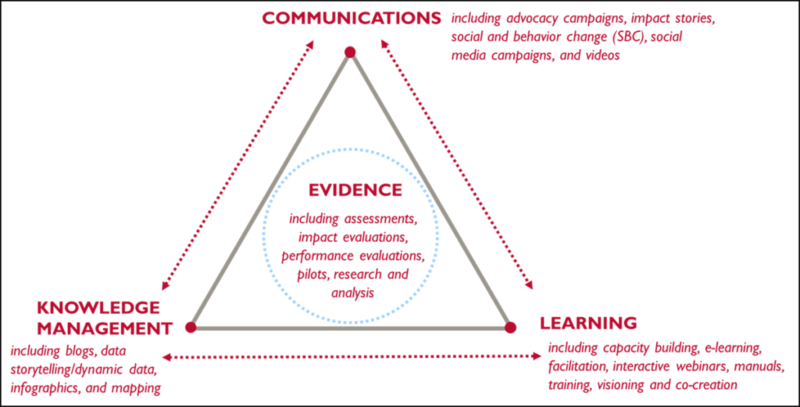 The CEL team uses a holistic approach that integrates evidence and research with knowledge management and strategic communications for development to broaden and deepen the influence, utility, and impact of USAID work. CEL works with USAID to strategically share, disseminate and apply/use the results of evidence-based knowledge to significantly increase capacity and commitment among USAID development stakeholders that work across key USAID objectives to improve women’s economic empowerment, enhance food security and nutrition, mitigate conflict, foster equitable economic growth, promote resilience, support climate change adaptation and mitigation efforts and improve urban health, service delivery and governance. Evidence – Knowledge Generation: Build upon and expand the body of evidence-based knowledge in the land sector, urban space and locally-led development through rigorous impact and performance evaluations; research and analysis; assessments; and pilots. Impact and performance evaluation activities can measure project effectiveness, relevance and efficiency; inform on resource allocation; and generate systematic and rigorous evidence, knowledge and learning at all points in the USAID Program Cycle. Communications – Knowledge Dissemination: Organize, curate and effectively share evidence, lessons learned, identify best practices and data/information through targeted communication, knowledge management, learning and training activities that increase knowledge and capacity. Learning – Knowledge Application: Provide active, ongoing capacity building and support to ensure that best practices and knowledge are assimilated and applied/used to improve decision-making, policy discussions, program design, program implementation and program monitoring and evaluation.